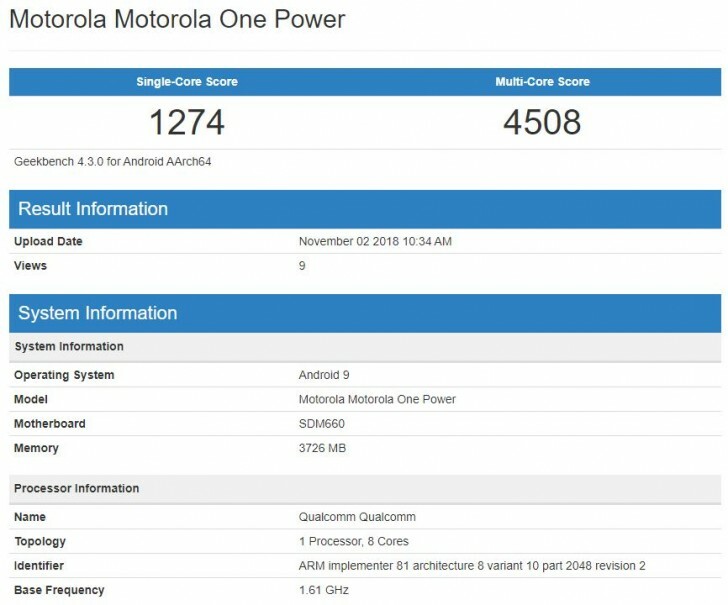 Motorola One Power with Android 9 Pie Spotted on Geekbench - Playfuldroid! The Motorola One Power that was announced in the month of September is an Android One smartphone. The same phone is selling with ZUI and P30 Note moniker in China. The One Power phone has been spotted on Geekbench with Android 9 Pie OS which indicates that the smartphone will be soon treated with the latest version of Android. Google had launched the Android 9 Pie OS and the company has promised to release the latest version of its OS to Android One phones at the earliest. In September, the Motorola One Power phone with Android 8.1 Oreo OS was unveiled. Few months after its launch, the phone has now appeared on Geekbench benchmarking platform with Android 9 Pie which indicates that this version of Android may soon roll out for the smartphone. The Motorola One Power Android 9 Pie update is expected to bring support for dual 4G VoLTE meaning that both of its SIM card slots will carry support for it. There is no confirmation on whether the company will be releasing beta version of Android 9 Pie for Motorola One Power users. Even if it does, the arrival of the Android 9 Pie may happen before the end of the year for Motorola One Power users.